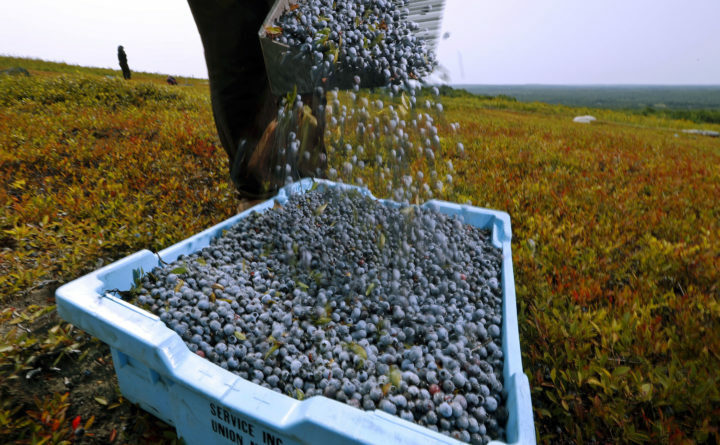 A worker pours wild blueberries into a tray at a farm in Union, Aug. 24, 2018. State agriculture officials said farmers collected about 57 million pounds of the wild fruit in 2018, down nearly 11 million pounds from the previous year. Growers in the No. 1 wild blueberry state suffered another bad year, but agriculture officials say there are reasons to believe Maine’s historic and troubled industry is about to turn a long-awaited corner. Prices to farmers, which topped out at more than $1 per pound in 2007, also do not appear to have improved significantly from recent years in which they lagged below historic levels, he said. Prices fell to 25 cents per pound in 2017 and appear to be returning from the bottom, but reached only 30 or 35 cents per pounds in 2018, Yarborough said. But Yarborough and some members of the industry also believe there’s reason for optimism. Excess inventory has held back blueberry prices in recent years, and Yarborough said that is likely to start changing in 2019 because of two straight years of modest harvest sizes. While the harvest was down last year, it was fairly similar to the crop size Maine used to see in the 1990s and 2000s, before larger crops became commonplace in the early 2010s. Homer Woodward, vice president of operations for Wyman’s of Maine, said he’s hopeful prices will start to track up in the coming years as excess inventory starts to dwindle away.